As much as we love to see exciting new architectural plans with eye-popping renderings, our favorite stories have to do with real-life structures that make people's lives better - and when they're designed and built by our readers, that's even better! 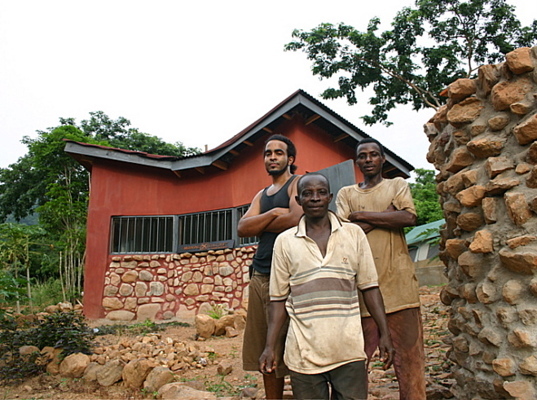 That's why we were thrilled when Inhabitat reader Brandon Rogers sent us pics of the eco-friendly buildings he's been constructing over in Ghana. Click through our gallery to see his "Bush Studio" made of earth and stone, and the progress that's being made on his latest project - a home made using bags of earth. Brandon is a native of Orlando who decided to move to Africa to get some hands-on experience building affordable homes after a stint at a design firm in the states. Now, instead of sitting in a cubicle, he spends his time developing affordable housing schemes and putting them into action. He’s studied a variety of practical building techniques, and gets fully involved in every stage, enabling him to get a feel for the most sensible approaches. Rogers has two key structures that demonstrate his efforts. The first is his rural studio or as he calls it, his “bush studio” which is located in the eastern region of Ghana on a plot of land that he acquired to practice his skills on. The building is made out of stone and mud, which originally triggered many raised eyebrows. 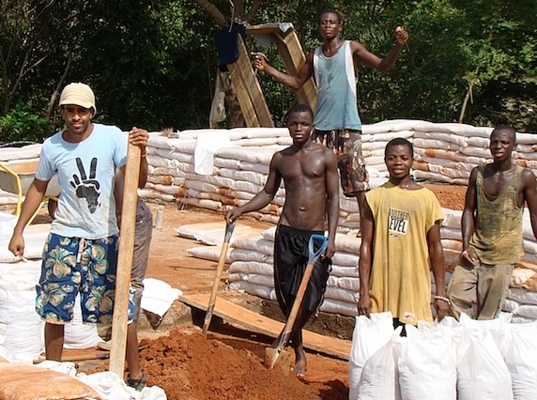 In Ghana and throughout Africa, there is a stigma associated with building with mud. Many locals told Rogers that it connotes poverty, but he decided to stick to his hope of building a structure using materials indigenous to the land. The Bush Studio is 12′ x 18′ (approx. 215 sq. ft.) and the walls are slightly angled so the front face appears curved and allows for a butterfly roof design, which is not only aesthetically appealing but more importantly creates a funnel to collect rainwater. The foundation of the building is composed of rumble stone built against a wooden framework. The blocks were made with a manual press from reclaimed soil from a hand dug well at a neighboring site. On the front face there are a series of vertical louvered windows which allow nice airflow and create a panoramic view. The building is reinforced with standard columns and a lintel beam, and the roof is framed using locally machined 2 x 6 wood. For the roofing, a roofing sheet called Onduline was used because its composition hinders the dissipation of heat. As for the entries, there is an over-sized barn door on one side so the space can be opened up to the exterior and a single bi-fold door on the opposite side. Rogers’ second project is an earth bag home located in the eastern region of Ghana near the township of Akosombo on the banks of the Volta River. Two structures are being planned for the site, the first of which is a guest house with approximately 1000 sq. ft. for one bedroom, a main space for the living/dining/kitchen areas and a multi-purpose room which will act as studio. The second space will act as the main residence and is going to be a two bedroom unit with a second floor loft. Rogers decided to use earth bag building because of its many benefits. The walls ended up being 20 inches thick, meaning they can resist the elements while at the same time cooling and protecting. In fact, Rogers asked a few hunters to shoot the walls with shotguns, and they were proven to be bulletproof. For the guest house, a wall was built using stone that was harvested from a neighboring mountain. From there, Rogers and his crew cast floor slabs and began the process of filling, sewing, ramping, and hauling the polypropylene sacks into place. The bulk of the walls went up very quickly over approximately a three-week period. The exterior was then plastered with a cement finish to minimize maintenance and then detailed with stone. The result of all of this work is a sturdy house made out of simple bags of earth. this is good but think it will be appreciated better if the cost and time needed to put up the structures can be compared to conventional ones. love to contact brandon rogers,could i hire him? would like his advise for a building project we have in mind in ghana. I'm in Ghana and will be going to see a similar structure a friend is building as his home. Do you have the contact info for Brandon Rogers? Brandon is a native of Orlando who decided to move to Africa to get some hands on experience building affordable homes after a stint at a design firm in the states. Now, instead of sitting in a cubicle, he spends his time developing affordable housing schemes and putting them into action. He's studied a variety of practical building techniques, and gets fully involved in every stage, enabling him to get a feel for the most sensible approaches. Rogers has two key structures that demonstrate his efforts. The first is his rural studio or as he calls it, his "bush studio" which is located in the eastern region of Ghana on a plot of land that he acquired to practice his skills on. The building is made out of stone and mud, which originally triggered many raised eyebrows. 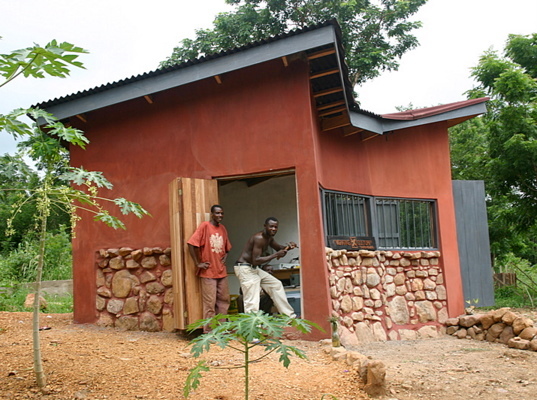 In Ghana and throughout Africa, there is a stigma associated with building with mud. Many locals told Rogers that it connotes poverty, but he decided to stick to his hope of building a structure using materials indigenous to the land. The Bush Studio is 12' x 18' (approx. 215 sq. ft.) and the walls are slightly angled so the front face appears curved. This allows for a butterfly roof design which is not only aesthetically appealing, but more importantly creates a funnel to collect rainwater. The foundation of the building is composed of rumble stone built against a wooden framework. The blocks were made with a manual press from reclaimed soil from a hand dug well at a neighboring site. On the front face there are a series of vertical louvered windows which allow nice airflow and create a panoramic view. The building is reinforced with standard columns and a lintel beam and the roof is framed of local machined 2 x 6 wood. For the roofing, a roofing sheet called Onduline was used because its composition hinders the dissipation of heat. As for the entries, there is an over sized barn door on one side so the space can be opened up to the exterior and a single bi fold door on the opposite side. Rogers' second project is an earth bag home located in the eastern region of Ghana near the township of Akosombo on the banks of the Volta River. Two structures are being planned for the site, the first of which is a guest house with approximately 1000 sq. ft. for one bedroom, a main space for the living/dining/kitchen areas and a multi-purpose room which will act as studio. The second space will act as the main residence and is going to be a two bedroom unit with a second floor loft. Rogers decided to use earth bag building because of its many benefits. The walls ended up being 20 inches thick meaning they can resist the elements, while at the same time cooling and protecting. In fact, Rogers asked a few hunters to shoot the walls with shotguns, and they were proven to be bulletproof. For the guest house, a wall was built using stone that was back-breakingly harvested from a neighboring mountain. From there, Rogers and his crew cast floor slabs and began the process of filling, sewing, ramping, and hauling the polypropylene sacks into place. The bulk of the walls went up very quickly over approximately a three week period. The exterior was then plastered with a cement finish to minimize maintenance and then detailed with stone. 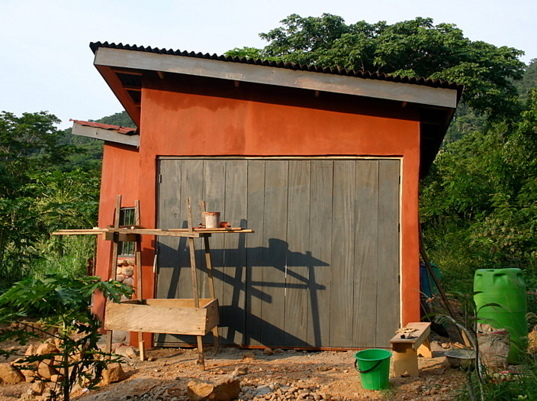 The result of all of this work is a sturdy house made out of simple bags of earth.